This amazing incalmo bowl features 3 separate sections that come together to form an absolutely stunning piece of functional art. The inner section features striking gold topaz murrini, and working with murrini is another three stage time consuming process. First Dirwood hand pulled the canes used to make the murrini, then he cut the canes into the individual murrini pieces, then he used the murrini to make patterns on the glass for the main center section. Make sure to view it from multiple angles, I'll stay it again... its amazing! Next, an elegant middle band of clear and an outer band of gold topaz were added. Each section was formed as its own separate molten bubble, then they were fused together and blown out as one unified bubble using the incalmo method. The final result varies from 12¾" to 14" in width, and varies from 6⅛" to 6¾". 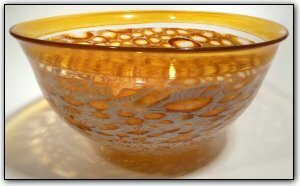 And finally, this bowl was set atop a pedestal of clear glass for stability and display.